For instance, it is a gas giant 2.8 times more massive than Jupiter, but only half as dense because the extreme radiation from its host star has caused its atmosphere to puff up like a balloon. And because it is tidally locked to its star — as the Moon is to Earth — the day side of the planet is perpetually bombarded by radiation from its star and, as a result, is so hot that molecules such as water, carbon dioxide, methane and hydrogen can’t form there. The properties of the night side are still mysterious — molecules may be able to form there, but probably only temporarily. 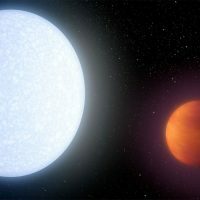 Subsequent observations confirmed the signal to be due to a planet, and revealed it to be what astronomers call a “hot Jupiter” — the ideal kind of planet for the KELT telescopes to spot. Other telescopes are designed to look at very faint stars in much small sections of the sky, and at very high resolution. The KELTs, in contrast, look at millions of very bright stars at once, over broad sections of sky, and at low resolution — a low-cost means of planet hunting using mostly off-the-shelf technology. A traditional astronomical telescope costs millions of dollars to build, while the hardware for a KELT telescope runs less than $75,000.